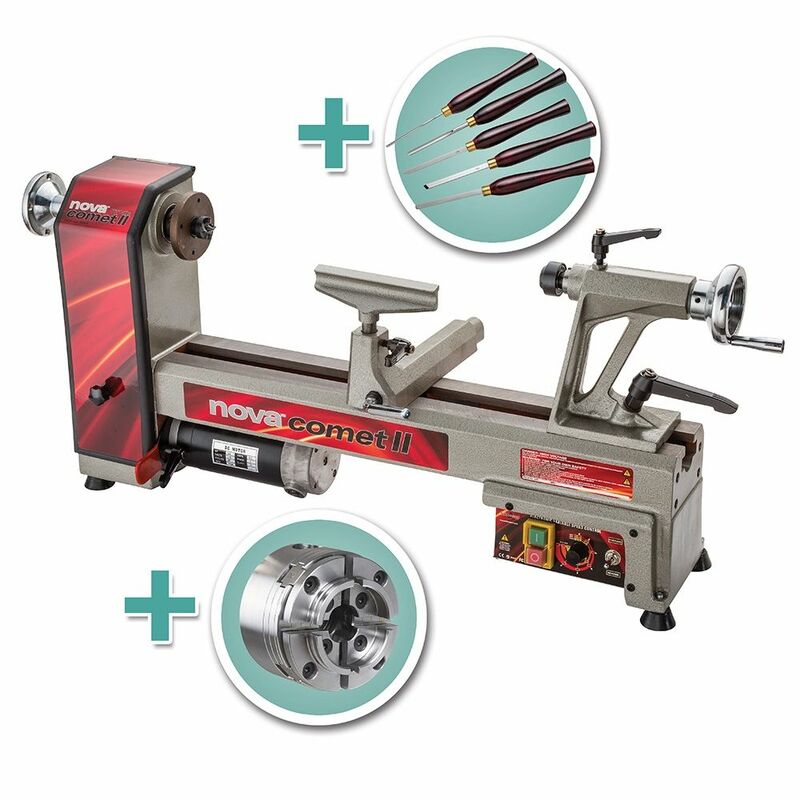 Value-added combo package pairs a compact, versatile lathe with a chuck and 5-piece set of mini turning tools! Total package value $754.97! Full-service lathe package includes a versatile chuck and 5-Piece Mini Turning Tool Set so you can start turning right away. 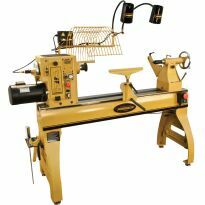 Comet II lathe features electronic variable speed with a wide RPM range from 250 to 4000 RPM. Forward/reverse switch for flexibility and a superior finish. Optional Versaturn accessories let you use it as a grinding wheel, wire brush, sanding disc, belt sander or wet stone. 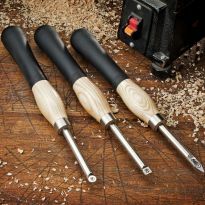 Included turning tools are 10'' long—perfect for pens, bottle stoppers and other small items. HSS for easy sharpening and good edge retention. 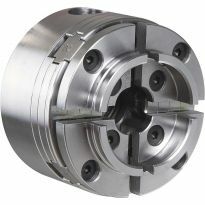 Included Nova G3 Comet II Chuck has a locking set screw for safe use in reverse. It is a four-jaw, self-centering scroll chuck with a high-powered TuffLock™ grip for incredibly solid, vibration free performance. Single-handed operation for easy setup. 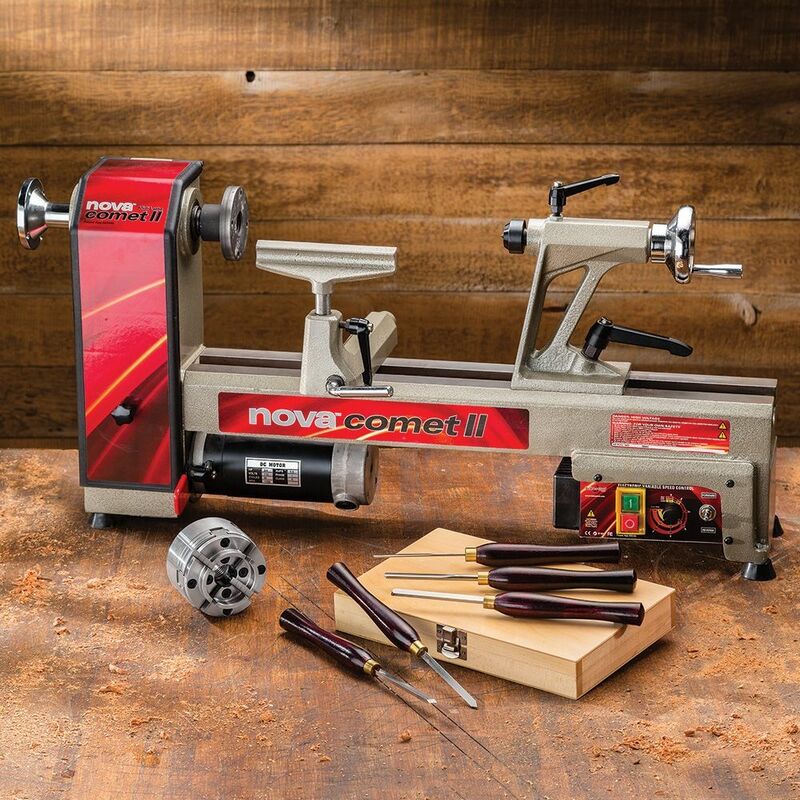 It has less weight, and less overhang than the larger chucks—perfect for the Comet II lathe. Minimal 1.79'' body length maximizes your distance between centers, and reduces stress on the spindle. Includes a set of 2'' (50mm) jaws. There is an additional $40.00 shipping charge for this item. Full Packaged Weight: 1.4 kgs/3.1 lbs. Love my new lathe. 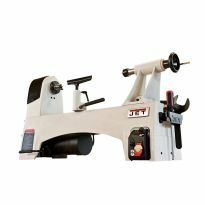 I have been shopping for a new midi lathe for a long time and I am delighted with the quality and function of this lathe. For a beginner and never wanting to shop at harber freight i have to say this was a great buy! The mini turning tools are what they say mini. Very small and kinda challenging to use at first but they do their job mostly. I am impressed with how easy and versatile this lathe is though. Easy to use and work with. 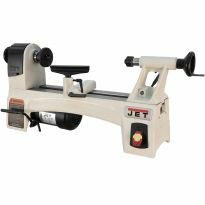 Great beginner lathe for the price. I have had this lathe about a month. I could not happier. The price was within my budget and so far I have had very good luck. It run very quiet. I am a beginning turner so I am learning something new every day. This was a very good buy for me. This lathe is exactly what I was looking for. It fits my shop with the option to add on with the table extension. I’m new to this game and I have in one week made a fish wacker and two goblets. The machine runs smooth and Quiet with plenty of muscle, she’s not shy for power. Lots of attachments for this lathe also. Nova makes a great product I believe. The lathe and all LOOKS GREAT! Have not been able to run it yet due to the instruction manual. Page 14 talks about the on-off switch and how it works. On Page 15 it states to make sure the INDEX PIN is out before turning it on. Rockler nor Teknatool or anyone else had a new belt. I finely was able to call Teknatool and they came up with one. They did give me a free one. BUT I am still waiting to try it out. Very happy with my new lathe. I'm a beginner and it set up easy. Carefully read the set up instructions. The motor needs to run without a load to break in the brushes for about 40 minutes. Only downside to the package is that the mini tools are very small and very limiting on the work you can do. You will have to buy another set of turning tools. 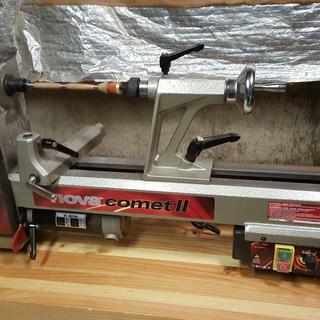 Comet Nova II, first lathe and am very happy with it. The lathe and chuck are awesome. The tools are pretty useless though. Love the lathe. The turning tools are a little light. They are for small projects. I ended up buying a different set of tools. I have had the Nova for about a week. This is my first lathe and am still learning. I was surprised on how quiet and smooth the machine is. The only disappointment is the belt cover. When I received mine, was a gift, the hinge for the belt cover was broken. My son is working on getting it replaced for me. Seems a bit flimsy there but the rest of the machine is awesome. I would recommend to any beginner. I bought this machine in 2016. Shortly afterward it ceased to work. Problem was the control box. It was replaced and all was fine until a year later. It failed again. Teknatool will not give me an answer other than I can ship the part in for repair at my cost. Their customer service is abysmal at best. Twice I've been given the promise of a decision from the "higher ups". The same customer service rep lied to me for a second time. Both times promising to call me back within the day. It appears to be just been a ploy to get me off the phone. I've spoken to two other dealers of this product who tell me that this is the type service to be expected from Teknatool. Rocklers customer service rep declined support and said I'd be called by someone in the area of Lathes. Never happened. Want a much better designed machine, buy Rikon or Jet from another dealer. I did. I've always wanted to try a lathe. My neighbor has a lathe and does wonders with it. Reviews by professional journals and websites and comments of customers. Large throw for a small lathe. Package deal. Compared the Penn option with all the extras, but in the end just had to choose one.. Excellent reviews, Nova has a good reputation. Hopefully this will be a good machine for me . We saw it in the store and thought it looked like a great deal. My husband didn't have a lathe. a lot of research, solid brand name, a lathe I can grow with over time as my skills improve. the package was also nice being a first time buyer. 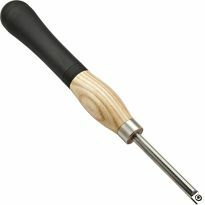 Can you upgrade the turning tools to a different size like 3/8 instead of 1/4 and so on? 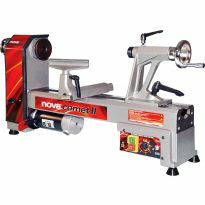 What are the dimensions of the Nova Comet II lathe? Specifically, the length and width of the base and the overall length of the lathe? Will this lathe allow working on stone? Can you get a bed extension for this lathe? Can you turn bowls with this lathe? BEST ANSWER: You should be able to turn bowls on this lathe. They will be small bowls because of the size. I am new to turning so I have turned some chisel handles and mallets so far. I bought the extension bed to turn balusters. I haven't turned a bowl on mine yet, but with the proper chuck and sharp tools, I think you could turn a bowl with this lathe. The diameter of the bowl would be limited by the throat depth of the lathe. You can turn bowls. May consider using different tool rest on deeper bowls. Yes. I've turned smaller sized bowls using it. Are all the lock handles plastic? BEST ANSWER: Yes they are plastic but I have never had an issue with them. 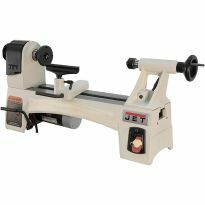 This is my first lathe so I have no experience with other models but I do not anticipate any issues with the handles. Yes the lock handles are plastic but the shafts are all stainless. I have had this lathe for a year with no problems. Yes, all of the lock handles are plastic. what is the over all length of the unit?